From left are Dylan Mcmurry, Ben George and Damian Coomes. Cannon Arts Dance studio is proud to recognize three of our local students as they head off to the Windy City to perform at the prestigious Ruth Page Center of the Arts. 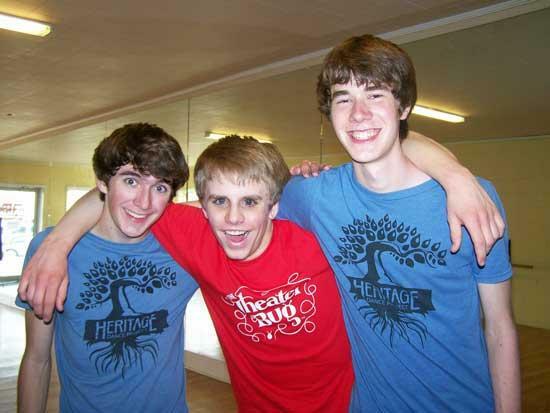 Dylan Mcmurry, Ben George and Damian Coomes have worked diligently under the direction of Kaleena De Var, Artistic Director of the Heritage Dance Company. One thousand pieces of choreography were submitted to the Chicago showcase and only sixteen were chosen for performance. We congratulate Kaleena and her students on their accomplishment. A fundraiser was held Sunday, March 20 at the Cannon Arts Dance Studio, that included performances by the Chicago bound trio as well as various offerings from Cannon Arts students. Donations were collected to help defray hotel and travel expenses. Where: Ruth Page Theater; Chicago, Il. For more information regarding donations or studio schedule, please call 563-9122 or email cannonarts@hughes.net.